Will 350.org Fossil Fuel Divestment Campaign Be Key Tactic in 2013 Battle over Climate Change? | Democracy Now! Will 350.org Fossil Fuel Divestment Campaign Be Key Tactic in 2013 Battle over Climate Change? co-founder and director of 350.org. He is author of Eaarth: Making a Life on a Tough New Planet. professor of sustainable development at the School for International Training and the author of Tropic of Chaos: Climate Change and the New Geography of Violence. “Problems With the Math: Is 350's Carbon Divestment Campaign Complete?” By Christian Parenti. NERMEEN SHAIKH: We turn now to a conversation about global warming and how to confront it. Some have called 2013 “year zero” in the battle over climate change. This comes as 2012 was a year of extreme weather, from the melting of the Arctic to Superstorm Sandy, to the massive typhoon in the Philippines. It was also the warmest year on record in the United States, with massive droughts and frequent wildfires. The tour has since ended, but the fossil fuel divestment campaign it launched is growing. College students on more than 190 campuses are calling on their universities to pull endowments, estimated at a total of $400 billion, out of the fossil fuel industry. Two schools, Unity College in Maine and Hampshire College in Massachusetts, have already taken action. Unity College President Stephen Mulkey explained the decision in part by saying, quote, “The colleges and universities of this nation have billions invested in fossil fuels. Like the funding of public campaigns to deny climate change, such investments are fundamentally unethical.” At Harvard, the school with the country’s largest endowment, 72 percent of students voted in favor of divesting from fossil fuels, but officials have pushed back. Meanwhile, the mayor of Seattle has called on his city to strip fossil fuels from its two main pension funds, and Democratic Senator Sheldon Whitehouse of Rhode Island raised the campaign in a speech from the Senate floor last month. SEN. SHELDON WHITEHOUSE: We are, as I’ve said in previous speeches, sleepwalking. As Congress sleepwalks, Americans actually are taking action on their own. In coordination with the nonprofit organization 350.org, for example, students at more than 150 colleges and universities across the country are pressing those institutions to sell off the portions of their endowment portfolios that are invested in fossil fuel companies. These students are imploring their schools to weigh the real costs of climate change against the drive for greater financial returns and divest from the polluters. This type of divestment campaign was employed effectively in the 1980s to pull investments from South Africa during apartheid. With American college and university endowments estimated to total more than $400 billion, this movement by students deserves significant attention. AMY GOODMAN: Democratic Senator Sheldon Whitehouse of Rhode Island, speaking last month. In light of the weak climate deal reached at the U.N. climate change summit in Doha, Qatar, many environmentalists have welcomed the fossil fuel divestment campaign as the new frontier in their activism, seeing it as, well, in the same spirit as the ongoing campaign of nonviolent civil disobedience against Keystone XL pipeline here in the U.S. and the growing Idle No More campaign in Canada for indigenous and environmental rights. Well, to discuss this and much more, we’re joined now by Bill McKibben of 350.org and Christian Parenti. Bill was just voted Vermonter of the Year by the Burlington Free Press. He is founder and director of 350.org and author of Eaarth: Making a Life on a Tough New Planet. He joins us via Democracy Now! video stream from his home in Vermont. Christian Parenti, professor of sustainable development at the School for International Training, author of Tropic of Chaos: Climate Change and the New Geography of Violence. We welcome you both to Democracy Now! Happy New Year. Bill, let’s begin with you. Can you lay out this campaign that 350.org has launched around the country? We badly need governments to act, but of course governments haven’t acted over the last 25 years, despite the huge efforts of many of us to get them to act. One of the reasons is that the power of the fossil fuel industry in our political system is so great that governments are constrained, not just in Washington, but in capitals around the world. So we’re trying to change that political dynamic some. We’re trying to really take on the fossil fuel industry and demonstrate—the sort of core of all of this, Amy, is a long piece I wrote for Rolling Stone last summer, a piece that went oddly viral, that demonstrates pretty convincingly that the fossil fuel industry has in its reserves five times the amount of carbon that even the most conservative governments think would be safe to burn. They are, in other words, a outlaw against the laws of physics. We’ve got now to put them on the defensive. That’s what the fight is about. And that’s why it’s good news that this has suddenly turned into the largest student movement in a very long time. NERMEEN SHAIKH: Christian Parenti, can you respond? You’ve been critical of this campaign for divestment. Can you explain why? CHRISTIAN PARENTI: Yeah, well, I mean, I’m really glad to see this, all this wave of activism, but I question—I wrote a piece questioning some of what was in the early roll-out of this, that there was—this divestment campaign was taking the fight directly to the corporations and hitting their bottom line. Now, first of all, 350.org and other groups have been doing great work that already took the fight directly to the corporations—fighting Keystone XL, etc. And my argument is that by focusing on divestment, you don’t actually take the fight closer to the corporations; you take it to the board of trustees. And I’m not against the divestment campaign. I think that the question is: How does the divestment campaign turn a political spectacle into real political power? Because the thing is, divesting from fossil fuel companies isn’t going to hurt their bottom line. Fossil fuel companies make money by selling fossil fuel. Many of them don’t even sell stock. Koch Industries doesn’t sell stock; it’s a privately held company. Seventy percent of the oil reserves in the world are held by state-owned companies. So, if the universities all divest, what might this do? It might lower the price of stock a little bit. That’s not going to hurt their profitability. It can—you know, there’s a way in which, early on, there was an element of miseducation unintentionally involved in this. And I think one of the few things that progressive movements can guarantee—we can’t guarantee victory, but we can guarantee a good political education. So, I think we have to be realistic about what divestment will achieve. And you have the direct impact of lowering the fossil fuel—the stock prices of fossil fuel companies. What will that do? I don’t think it will do that much to hurt them. You have the other aspect, the indirect aspect, which is this huge spectacle of students mobilizing. How can that be turned into real political power? And I argue that, ultimately—and I don’t know how exactly—it comes down, I think, to state action. If you look at the anti-apartheid movement, you look at the tobacco campaign, ultimately what happens is that governments step in. In the anti-apartheid struggle, 25 states imposed trade sanctions on South Africa, including the U.S. Reagan tried to veto this; he was overridden by the Senate. That’s what really turned the tide, and divestment was part of that. Tobacco—when do people stop smoking? When states start banning the sale and use of tobacco. That’s when people start quitting smoking and the profits go down. So I think we have to be realistic about what the limits and also the real possibilities of divestment are. AMY GOODMAN: Bill McKibben, your response? BILL McKIBBEN: Well, look, I think Christian got it just right in his original article in The Nation. He said this isn’t a complete strategy. And it’s not. Look, there’s no—this is the biggest problem we’ve ever faced, climate change, and there are lots of things that we have to do. But this is a very powerful one. You know, when Nelson Mandela got out of prison, his first trip was—one of his first foreign trips was to the U.S. And he didn’t go to the White House; he went straight to the University of California to thank students there who had forced the divestment of $3 billion worth of stock in companies that did business with apartheid, big companies who you couldn’t put out of business, like General Electric, but that nonetheless felt the heat and made some change. The tobacco analogy is a good one. It’s not—I mean, Christian, I think, may have misspoke when he said that smoking went down when states banned the use of tobacco. No states banned the use of tobacco, but we did change the conversation in profound ways. And eventually, once public opinion leads, then states follow. It’s, I’m afraid, at this point not a good idea to wait for our so-called leaders to lead on climate change. So far, they haven’t done it. But maybe we can open up, as Christian suggests, I think, some space for them to operate. If we can remove, to some degree, any degree, their fear of the fossil fuel industry, which after all was the biggest player in the last election campaign—I mean, if you’re an investor in a fossil fuel company, you’re helping them corrupt our democracy. If we can remove some of that fear, then maybe we will open up some more room for our champions. By the way, this is not the only strategy we’re going after, that’s for sure. I hope everybody is well aware that on President’s Day weekend, the environmental movement—350.org and the Sierra Club have sort of been leading the organizing—are going to Washington for what will be the biggest environmental demonstration in a very long time, and it’s all about the climate legacy of this administration and continuing this fight on Keystone. As you know, the decision is coming up sometime in the course of the year, and it will be the purest test of whether Obama is going to side with the fossil fuel industry or with science. It’s a tough test and a tough fight, but I’m very glad that we have allies not only from people like Christian, but from young people all over the country. People—you know, people went through this long period of saying, “Oh, young people are apathetic about these issues. Why are they not in the street? Why are they not doing anything?” It’s really, really good to see them taking the lead. And as I say, it is them taking the lead; it’s not me, it’s not 350.org. AMY GOODMAN: Bill, I want to ask you something, since you raised Keystone XL. Do you think the announcement by Lisa Jackson of her retirement or her resignation from Environmental Protection Agency is partly due to her opposition to moving forward with Keystone XL? BILL McKIBBEN: I don’t know. Look, the Keystone thing has been, for me, sort of crazy from the beginning, Amy. The 20 most important climate scientists in the U.S. all wrote the president a letter saying this is not in the country’s national interest. Our most important climatologist, James Hansen, said if you burn all that tar sands oil on top of everything else that’s being burned, it’s game over for the climate. We have indigenous people from one end of the continent to the other now powerfully, in this Idle No More movement, pointing out that tar sands is a perfect example of the sort of exploitation they’ve had to live with for hundreds of years. There’s no reason to do this, except that it helps rich oil men. And I can’t, for the life of me, understand why it’s been so hard to block it. We’ve done everything we can think of. We were able to delay it for a year with the largest civil disobedience action in 30 years in this country. Let’s hope that we can keep the pressure on. That’s what this President’s Day thing is all about. And if you go to 350.org, you’ll see the—all the information you need about how to get there and be a part of it. NERMEEN SHAIKH: On a recent edition of Fox’s Red Eye, a four-person panel slammed college students for organizing a fossil fuel divestment campaign. This is the host of the panel, Andy Levy, who begins by speaking to Ambassador John Bolton and then moves on to Fox News reporter Sandra Smith. ANDY LEVY: Sandra, you agree that colleges need to run their endowments like a business to maximize their return, so morality should play absolutely no part in this. SANDRA SMITH: Oh, well, I mean, nobody is saying it’s immoral to invest in a clean coal company, clean burning coal company, or a domestic energy company, you know. SANDRA SMITH: I mean, to just attack all of these companies without any research, that it appears they didn’t do much of, then that is immature and irresponsible. I’ll stick by that. ANDY LEVY: All right. So, no climate change whatsoever as far as you’re concerned. SANDRA SMITH: There is not—still to this day, there is not a consensus among scientists. NERMEEN SHAIKH: That was Fox News reporter Sandra Smith speaking to host Andy Levy. Ambassador John Bolton was not included in that clip. Christian Parenti, can you respond to what was said on Fox News? CHRISTIAN PARENTI: Well, yeah. I mean, I—you know, that’s just Fox News obviously defending the fossil fuel industry. You know, my concern is about divestment. And to repeat, I think it’s great that there’s mobilization. I just think we’ve got to be realistic about what’s going on. And, you know, one of the problems with this idea of stripping the social license to operate from fossil fuel companies is that it plays into a sort of, you know, a media-oriented strategy that may not be that effective. If you think that the fossil fuel industry, oil industry—the oil industry is the least liked industry in the U.S. Every year Gallup does a poll, and oil is at the bottom. So, they don’t really have a social license to operate, and it doesn’t seem to affect them. So we have to think about how to mobilize—how to leverage this mobilization into ways that are actually going to hurt the fossil fuel industry. And I think, ultimately, in the long term, we have to have a conversation about government, and not just about what’s wrong with it and how it’s broken, but what it can do and what it does do. And we have—the EPA has, you know, the power to regulate greenhouse gas emissions, under EPA v. Massachusetts, and there is—if there is enough pressure, there is legal space to really start imposing a de facto carbon tax on the economy by making it expensive to pollute. The other tool that is here already is that government spends an enormous amount of money on energy. It has enormous fleet of vehicles, enormous fleet of buildings. And this doesn’t require going to the Republicans to ask them to pony up more money for renewable energy. If the government uses its power of purchasing to pursue a big green buy, clean purchasing, that will help jump-start a clean energy sector. And that’s something that universities can do, as well. I mean, I was looking at Harvard’s green plan. You know, they don’t own any electric vehicles yet. I mean, OK, Harvard doesn’t own that many vehicles, but that might be a place to pressure, as well. 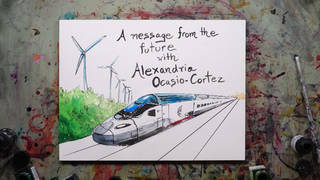 But I think, ultimately, down the line, we have to be very realistic about, like, the fact that the way the fossil fuel industries are going to be checked is with state power. And I commend Bill McKibben and everyone in 350 for this effort, but I don’t—I’m not sure any of us are clear on how to actually get this to turn into legal power to check these firms, because it’s not going to be moral suasion alone. They’re not going to back off of this incredibly profitable industry because people don’t like them, because people already hate them.